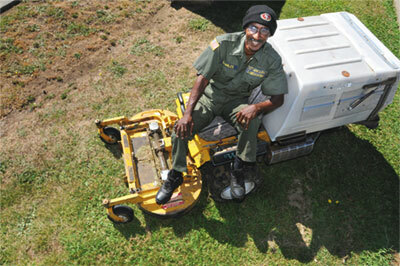 Charles Banks is thankful to be back on his lawnmower. The accident happened, as many do, with a moment of inattention. Charles Banks, 62, of Fairfield, was seated on a riding lawnmower, removing equipment from his landscape trailer at the end of a long day. It was April, and the self-employed landscaper had plenty of business. Suddenly, his lawnmower accelerated, jamming itself under the trailer. In the process, Bank’s right leg was badly broken. “I was trying to do too much at once,” Banks admits, looking back. But his quick thinking saved his leg from further damage. “I knew I was hurt real bad because my foot was lying crooked. I had to keep my wits about me,” he says. He jammed the mower into reverse and extricated himself from trailer. By chance, he had bandaged his leg that morning to help with arthritis pain. Now the bandage helped control the bleeding. As soon as he was free, he grabbed his cell phone and called his girlfriend, Linda McCumber. She arrived immediately and found a neighbor to help Banks off the lawnmower and into a car. They headed to NorthBay Medical Center. After a three-day hospital stay, Banks was released with a brace on his leg and crutches. Just five weeks later, with two plates and six screws in his leg, he was back riding his lawnmower. By July he was getting ready to discard his crutches. “I had excellent care throughout my ordeal, from the time I entered the ER until I was sent home,” Banks says.